Gili Trawangan is the biggest of the Gili islands which can be found nested quaintly off the off the north-western shore of Bali’s neighbour, Lombok. Tourists flock to the Gili islands mainly for the diving of which there are centres on all three islands Gili Trawangan, Gili Meno and Gili Air. Gili Trawangan is modest, you can walk the 7km shoreline in a matter of hours. One side of the island is more rambunctious, club-heavy, the other more tranquil and less trodden. GiliFit is the only gym on the island, or so I thought. There is a new gym that's opened within the busy-quarter. However, as with most modern shiny new things, it lacks the character of its counterparts. This gym very much feels like where Rocky would chop some wood and grow a beard, the other is more Drago-driven. There’s a cardio studio then the weights studio and also some free-weights outside to use. Sure there may be a little rust on the bars, but it’s part of the charm. I recommend hiring a push bike and doing a lap around the island. For just under £20 a night you'll be given all the basic amenities; hot water, a pool, air-conditioning, a bed, and even a tele with English speaking channels. You'll also have access to a personal trainer. Myself and my travel buddy This is Timothy enjoyed a brutal MMA workout with personal trainer Ri. Ri was is of Ugandan/South African descent and contorted me into shapes like he was playing a cootie catcher. (That's a deep pull for you kids). On hand are all the necessary supplements to keep you on the healthy train; protein shakes, juices, nutrition bars etc. Yes you'll find plenty of excoriating reviews online of GiliFit, some comparing it to a builders site etc. Some of these are old reviews. I have not received sponsorship nor any special treatment in exchange for this editorial. I was just taken in by the staff, to quote Russell Brand 'the heat of their sweetness could melt ice cones'. My advice is embrace the true 'Castway' vibe of this island. Forget about your hair-curlers or having the butler on call to point your toilet paper. 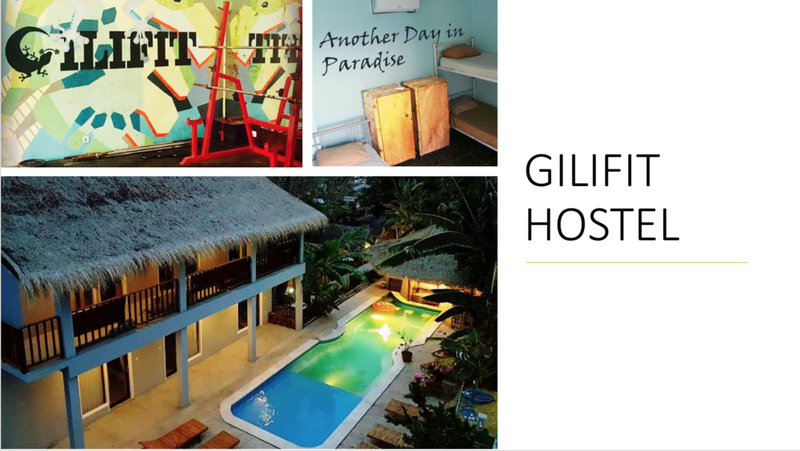 GiliFit is only like 5 minute walk from the main strip on the Eastern side of the island and a 15 minute walk from all the bars and nightclubs.